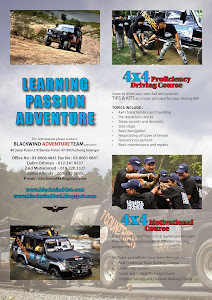 Blackwind Adventure Team a.k.a B.A.T have organised an Overland Family Trips on 08/12/12 to 12/12/12 as continuenity of our tradition to organise an event or program every year. It was started in year 2008, when have organised the off road trip to Mat Daling on 08.08.08 and 09.09.09, 10.10.10, 11.11.11 and this year 12.12.12. How ever this year we start the trip on 08/12/12 and we end on 12.12 am on 12/12/12 and we do make it when I myself reached our home exactly on 12.12 am 12/12/12. The trip started from Klang to Kg Budu, Benta in Pahang and continue to Cameron Highland and end up at Kuala Kangsar, Perak at our "Dusun" where we spent our holiday in the jungle and sleeping in the tents. We have a truly holidays while eating King of fruits "Durian" and other local fruit and the same times enjoying our time bathing the water stream. With total of 95 participants and 18 vehicles consist of 4x4 and cars we manage to travel approximately 1,000 km. It is a very memorable trip especially for our kids and familys when we spent our time together.